You travel all over the world as a pro rider, I guess it built your network among the industry. Also you worked at a distro in Australia. Which experience helped more if you compare? Yeah I traveled extensively over the years as a pro rider, not so much these days but that definitely helped the most I feel. Just being seen & known around the world as a pro rider for all those years helped so much with credibility for Colony. It helped with rider acceptance, product knowledge & contacts all over the world. Working at a distro also helped but not as much as being a pro rider that is for sure. What do you think is the key point to get in the US BMX industry? Colony has been lucky in that we have never really had a strong USA rider yet we have been able to crack the USA market with very little trouble. Having riders like Ryan Guettler based in the USA helped for sure. 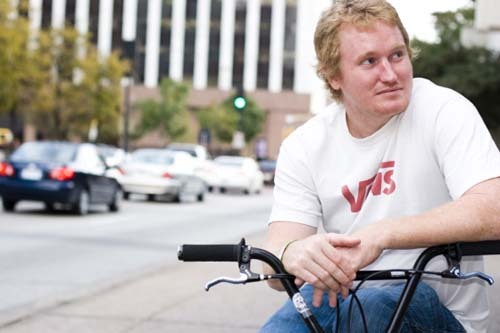 Even though he is Australian he is based there for 9 months of the year & so he is in the USA BMX media all the time. Our team is 95% Australian based because I want to support the Australian riders who stay in Australia & make it that they can earn somewhat of a living from BMX. Australian riders are also rather favored out there in the USA so I think that helps with our sales & image there. Our products also speak for themselves as I would like to think they are some of the best out there. What is important to keep the growth of your business? It is important to keep the brand in everyone's minds by always having fresh products, having the team out there getting coverage & also presenting the whole Colony package as something desirable to all. This takes plenty for work but is all worth it for sure.